So while hubby continues with his meat fests, I am a carb girl and need some sort of carb with my meat. As such I have come up with a delicious (and extremely fattening) side for any BBQ. There are loads of alternative ways to mix this up but the basic recipe stays the same, I’ll list a load of different ways, and a few cheat ideas at the end. I boiled the pots on the stove for about 15 mins until they were soft. In the meantime I minced all the garlic in a masher, and mixed it into the butter (which I left out on the side so it was soft). Stirred in a good pinch of salt and mixed in the pots when they were cooked. Now this is the clever part, I then handed the pan over to hubby, with his skillet thing for him to finish on the BBQ. 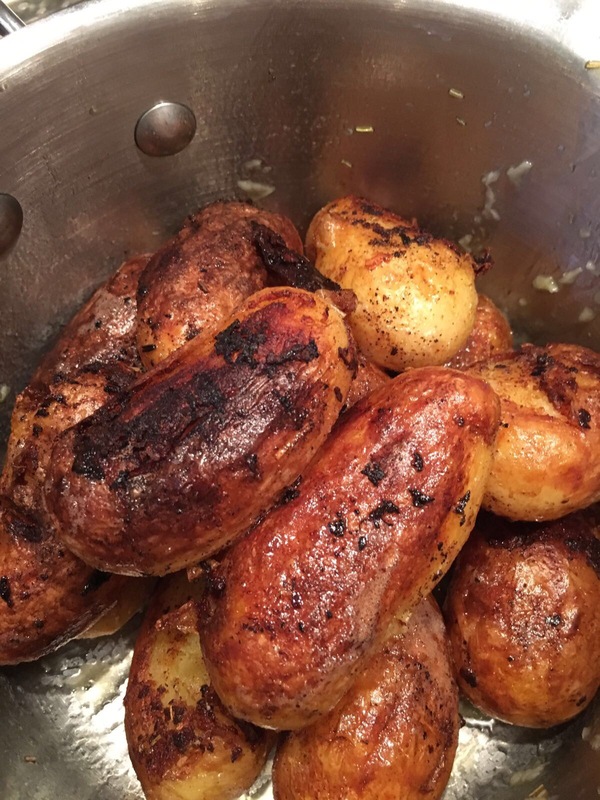 He heats up the pan and gets them all crispy and it’s like he’s created these amazing potatoes. Sprinkle with a bit of sea salt and viola! Add a tblsp of cumin or curry powder to the butter to make Spicy ones. Add spinach and onions to the above to make a Bombay style one. Add 2 tblsps of paprika to make a smoky version. Add juice of a lemon and tblsp of parsley, perfect with fish. Add 50g of parmasean and tblsp of basil to the butter, make them Italian style. Add bacon lardons or pancetta to the original or Italian version. Also once cooled could also mix through some mayo for an alternative potato salad. This would work with any of the above versions. Cheat ideas (always good to speed things up)! Buy pre minced garlic (be careful though as this is stronger than normal!). Melt your butter in the microwave if it’s too hard and then stir in the garlic. Beware – fresh herbs will add a different taste, more fresh and in depth compared to dry herbs. All depends on if you can be bothered with fresh ones! If other half moans about putting them on the BBQ or you want to do it without a BBQ do exactly the same but stick them on a baking tray and pop in a hot oven for 15/20 mins. Oh yum hat a delicious sounding potato recipe, I have to admit I am a huge fan of different types of potatoes so I am going to have to try this recipe. These look delicious and I would love to have these with some salad. Perfectly browned and crisped up. I had the left overs chopped up cold and mixed in with a salad the next day, they were still lovely! I LOVE carbs. I just want them all of the time. These sound delicious and not too hard to make. Thanks for sharing. Oh my! This looks too yummy for words – you had me at the title! So handy too because these will accompany so many things – perfect! Ditch the garlic part! Any of the other ideas all would work well without garlic, Bombay, lemon and parsley or dill. If you want different heat tried minced ginger instead. These look absolutely delicious! They would make a great side dish to our weekly roast dinner! This looks soooo good and the perfect companion to a nice juicy steak. Definitiely not healthy not on the healthy side, but totally worth it as a treat or for a family bbq. Oh my goodness!!! These look amazing!!! I;m crazy for a good potato and these look glorious!! I’m absolutely bookmarking this post for later!! Omg these look so good!! I would have never have thought about cooking these outside on a BBQ though. Will have to try it. I love garlic and all the recipes that have garlic in it. This sounds like a really easy but delicious recipe to do. You had me at garlic! The more garlic the better when it comes to garlic I say! I love potatoes, and these look utterly delicious. 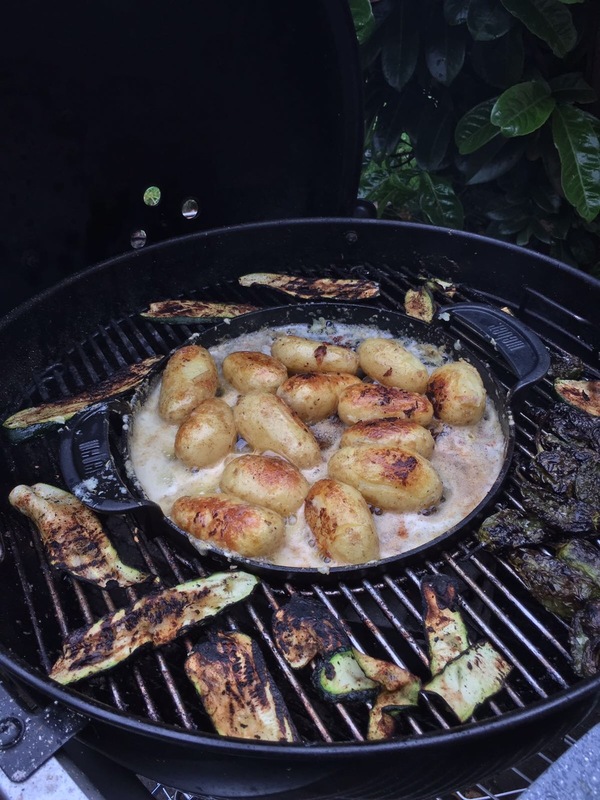 I like the idea of the pan on the barbeque, as there is something rather splendid about eating out during summer. This shows you don’t have to stick to barbequed meat and veg. Lovely.